So yesterday was Independence Day. I haven’t really liked this holiday in a long time. I have fond memories of driveway fireworks with my parents and brother from my childhood. But as an adult, it has never really resonated. My dislike goes beyond being a parent of young children (and the lack of sleep that neighborhood fireworks creates for all of us) or recent political developments (that leave me feeling less celebratory about my country’s history). No… the unease and discomfort I feel on this day is more than that. I spent some time yesterday contemplating what it is I feel and why. Then, last night at bedtime, I found myself trying to get both of my overstimulated kids calmed down enough for sleep, with my own nerves feeling frayed and seeing my husband feeling equally anxious. He snuggled our daughter while I guided our son in some deep breathing and visualization exercises. And I was reminded of the evolution of the human nervous system. You see, humans were never meant to live in such a fast-paced, stimulating, noisy world. Not physiologically. Our bodies–our brains and nerves–evolved over thousands of years in much quieter, slower environments. 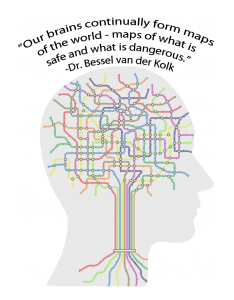 To hear Bessel van der Kolk tell it, much of our primary response system–the “fight or flight” part of the brain that evolved as a defense against danger–actually developed hundreds of thousands of years ago. And the human body’s response to loud noise (like that created by fireworks) is to ready the body in preparation for defense… before you even realize you’ve heard it, that noise has signaled to your nerves that danger is coming and you must respond. So your heart rate changes, your breathing becomes shallow, your muscles engage, and your nerves start buzzing. 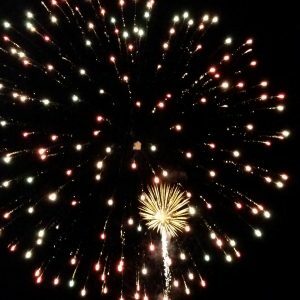 This response happens to most of us, in varying degrees, no matter how much the logical part of the brain reminds us that those noises are harmless… “It’s only fireworks, nothing dangerous here.” But your nerves don’t know that, so each BOOM signals another rise to defend against danger. And if you’re highly sensitive, like my family and I are, this response is even more pronounced. This is because, like the other 15-20% of the population that is highly sensitive, our brains react differently to outside stimulation; our threshold for response is lower than most people’s, so even quieter noises or distant “booms” activate this defense response. 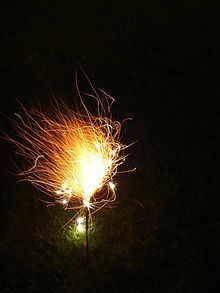 Our evening began calmly enough–lighting sparklers in the driveway and enjoying the lights of our neighbor’s fireworks. As we came inside, my 10-year-old was enjoying the lights so much he called it “a magical time.” The novelty soon wore off, however. As the sun sank deeper and the sky grew darker, more neighbors started to celebrate and, eventually, we could hear the cacophonous echoes of a dozen nearby city firework shows that continued for the better part of an hour. As we readied for bed, I could feel the agitation grow in all of us; neither child wanted to go to bed, afraid of being asked to listen to the distant booms alone in the dark. Were we all being too anxious? Or was this simply a human response to an unnaturally stressful, markedly inhuman experience? I clearly believe it to be the latter. 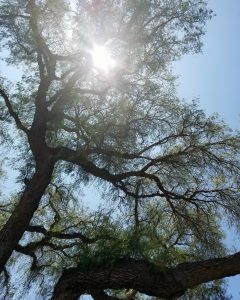 My research on the brain, trauma, depression, and anxiety has shown me how so much of the discomfort we feel in modern life can be traced back to a natural human response to unnatural experiences. There’s a part of our brain that thinks those noises mean danger. Because many years ago, when humans and animals lived in nature, loud noises meant danger. Every time you hear that noise, that part of your brain is preparing your body for defense, to keep you safe. It doesn’t know they’re only fireworks, they’re only pretty lights in the sky. So every time you hear a noise that makes you jump, you just have to help it understand. Just say, “Pretty lights, magical time,” and take a deep breath. For several minutes, we snuggled in bed together. And every time we heard a BOOM, I sang softly, ♪ “Pretty lights, magical time” ♪ until I heard their breathing slow and the tension ease. Eventually, I slipped away into my own room to continue my own meditation until the noises (and my nerves) began to quiet. I am often asked how mindfulness practices like yoga and meditation help with anxiety or stress, and this is my answer. Not all yoga happens on a mat, and meditation doesn’t need to be done in silence. And that’s the beauty of this practice. I still take yoga classes and practice on my mat (at home or in the studio), and I still meditate sitting cross-legged with my eyes closed. But I also practice my mindfulness while sitting in traffic or watching my kids play at the park, while weeding the garden or folding laundry. Just last week I shared on Instagram my short practice at a random park, surrounded by chirping birds and a gentle breeze in the shade. So in the honor of continuing my own practice, I am going to be signing off for a few weeks. Every summer, my family and I vacation in the Utah mountains. 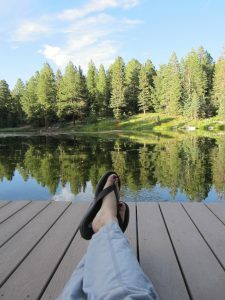 Our family cabin is one of my favorite spots to unplug from modern life and recharge my soul, surrounded by nature and connection with loved ones. I may share a few pics on social media while I’m away, but I will be taking a break from teaching while I work on refilling my own cup in the best way I know how. I will miss sharing my love of this practice with friends and students, but I know I will be better able to meet the needs of myself and others when I return in August. I wish you all a lovely summer and look forward to seeing you again soon!